I’ve just received some breaking news for those of you who will be at the Greater New York meeting this week. Make sure to stop by the Owandy booth and check this out! Middlebury, CT – Owandy Radiology Inc., a global leader in the manufacture of dental radiology hardware and imaging software recently received FDA 510 (k) Clearance for its innovative 3-D wall-mounted panoramic digital radiography unit. The company will be showcasing the I-Max 3D during the upcoming Greater New York Dental Meeting in booth #5125. When it comes to owning a 3-D panoramic digital radiography unit, cost and physical space are the most common obstacles for many dentists. The I-Max 3D effectively addresses both issues, which is why it is selling briskly in many other parts of the world. • The sleek and light-weight I-Max 3-D is only 145 lbs. and is shipped fully-assembled in one box. It can be easily wall-mounted by one technician. • Comes equipped with a cone beam flat panel which delivers high-definition image quality. • Automatic Layers Integration System (ALI-S) ensures exceptional image quality and automatically selects the best images. • Multiple FOV’s (Fields of View): 4 volume sizes to choose from :12x10 cm ideal for implantology-full mouth and condyle, 9x9cm for a full mouth, 9x5 cm for a full arch. • Endodontics Recommended: With its small 5x5cm volume coupled with an excellent resolution of 87μm. • 24 Programs (including adult and child versions): Enable a full range of examinations required by today’s dental practice. • Includes an intuitive, user-friendly Human Machine Interface (HMI) with automatically-integrated imaging tools and image-enhancing filters. • CAD/CAM Ready: Equipped with QuickVision 3-D software for comprehensive case planning and can share .STL files from a dental lab or a digital scanner. 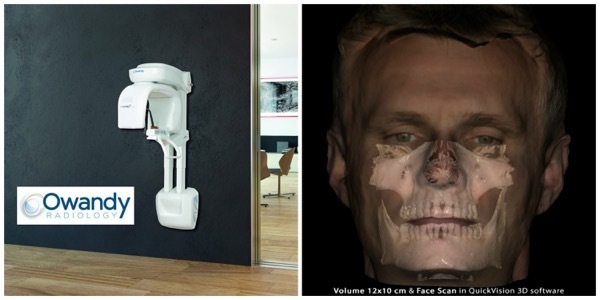 • Face Features Scan: You can import .PLY or .OBJ files into your 3D software and associate the corresponding 3D volume. • Implant surgical guides included. Distributors inquiries are always welcome. Headquartered in France, and serving North America from Middlebury, Connecticut, Owandy Radiology is a global leader in the manufacture of dental radiology hardware and imaging software. Its products are distributed through dental dealers all over USA, and in 50 countries world-wide, on every continent.